Home >> Prof. Development >> Free Voluntary Reading (FVR) Pays Big Dividends! 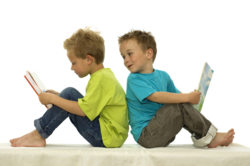 Free Voluntary Reading (FVR) improves students attitudes toward reading. Thats the finding of William Marson, a sixth-grade teacher at Elim Elementary School in Hilmar, California. Parents of sixth graders who have participated in Marsons FVR program said in a survey that their children spent the same amount or more time reading at home than they had the previous year (100 percent) and that their children seemed to enjoy reading more (91 percent). Free Voluntary Reading is just as its name states. Its free reading; students are free to choose the materials they want to read. And its voluntary reading; students can choose to -- or not to -- report in-class on the reading theyve done. Students are also free to -- or not to -- read at home. FVR is Sustained Silent Reading in its purest form. No requirements! No book reports. No journal entries. No chapter questions. No required home reading. "Its a chance for students to kick back and read, no strings attached," says Marson. Its a strategy voiced in numerous articles by Stephen Krashen (see below)---a strategy that Marson decided was worth a shot. Anything to motivate students who have lost interest in reading! "Parents and educators readily agree that reading is the key to success in school," Marson wrote in an article published in The California Reader (Spring 1997). "It is my theory that if students spend more time reading interesting and enjoyable (dare I say easy?) materials, they will learn to read better, which will in turn lead to more reading. This, ultimately, will be of tremendous life-long benefit to them." spelling and control of grammar improve. Sustained Silent Reading was scheduled during the school day. Marson also cites the research of Jim Trelease in The Read-Aloud Handbook, Penguin Books, 1995). Trelease wonders why 100 percent of students beginning kindergarten are enthusiastic about learning to read but, by 12th grade, only 25 percent of students read for pleasure. Treleases research reveals that one of the factors that produced higher reading results was the frequency of Sustained Silent Reading in school. SO THERE MUST BE SOME REQUIREMENTS? No requirements! But students in Marsons class have lots of options -- and there are rewards for reading too! Each day, a 45-minute period is set aside for Reading for Fun (RFF). The first 30 to 35 minutes is for reading. A ten-minute "book talk" session follows. During book talk, students share their enthusiasm for the books theyre reading. "Book talk is the greatest advertisement for reading," says Marson. "The best part is that the advertisements come right from the kids mouths!" Of course, book talk is totally voluntary. But as the excitement builds, students want to be part of it. Students have other options too. Some students choose to review a book for the classroom newsletter. Marson has found that small-group sharing works too. Students share their reading excitement in small groups; then one spokesperson from each group reports to the class about the books the group has been reading. And there are other motivators. Each trimester, students collect stars on charts that indicate that theyve become members of The 200 (pages) Club. As the trimester goes on, new clubs (The 400 Club, The 800 Club ...) are introduced. "In the most recent trimester, my top reader joined the The 6,600 Club!" Marson says proudly. In-class and at-home reading are included in the clubs. Marson verifies students in-class reading; parents verify at-home reading. Of course, many students are motivated to read. They would read if there was no FVR, no book talk, no 400 Club. Some students, however, need encouragement -- and thats the intent of Marsons free-voluntary RFF program. Some students even benefit from providing suggestions for appropriate reading. "One must be ever-mindful of the fact that poor readers need more help than others in selecting interesting and easy books to read on their own," said Marson in The California Reader. "Reading unsuccessfully for 20 or 30 minutes can serve to demotivate a student quickly." "Free Voluntary Reading is not a panacea, and it should definitely not be used as the only reading program," states Marson. "It can be a beneficial addition to a strong instructional reading program." The results of Marsons own survey of his students parents supports the effectiveness of RFF/FVR. Twenty-three parents responded to two survey questions. How would you rate reading as an activity that brings you enjoyment? NOTE: William Marsons class of 32 sixth-graders was one of five sixth-grades in a rural school of 1,000 students. The school operates year-round, using a trimester system. Marsons class in the study included 13 students who came from homes where the primary language was Portuguese. Nine students in the class were resource students. The majority of students were from working/middle class families.